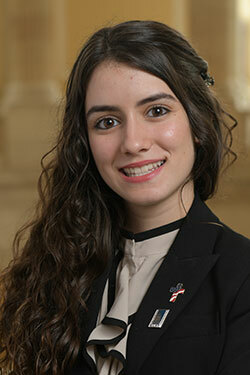 Debora Gonzalez is a senior at School of Advanced Studies, Wolfson and is pursuing an associate’s degree from Miami Dade College. Her passion for serving children and adults who suffer from illness has led her to get involved in her community in varies ways. She is involved in her church community, where she cares for and teaches Sunday school to toddlers. She takes pride in her board service for the Aid For Families In Need Corp (AFFIN), an organization dedicated to bringing hope to families locally and abroad who struggle to meet their most basic needs. By bringing together her work at AFFIN with her leadership roles in school, Debora has organized and carried out drives and fundraisers to support orphanages and other community projects abroad. Debora has prepared herself to enter the medical field by taking the most demanding advanced placement courses in biological sciences at her high school. She has attended the National Student Leadership Conference in Medicine and Health Care at Harvard Medical School, is head volunteer and project initiator for Aid for Families in Need Corps, and is the current President of her Student Government Association. She is able to remain actively involved all while maintaining an impressive 5.294 GPA. Debora was recently accepted to Harvard University under their early action program. Debora’s accomplishments include being recognized as the Bezos Scholar of 2016, and receiving the Alexander Hamilton Scholar Award. A recent Gold Winner of the Hispanic Heritage Foundation’s Youth Awards, under the category of Healthcare Science for the Miami region Debora is on her path to being one of the best biological medical professionals of her generation. To support dynamic students like Debora and CHCI’s programs such as R2L NextGen, please visit: www.chci.org/donate.